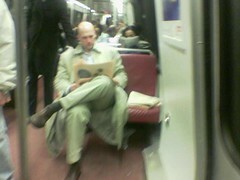 Looks like a pretty important newspaper you’re reading there, mister. You even saved a seat for Section B! At Friday night rush hour with delays on the Red Line and a crowd of people getting on! What newspaper is that, I wonder? Probably some big international finance spread, eh? Kudos to you, Mr. DC Big Shot!